South Grove Primary School - Play in a Day! 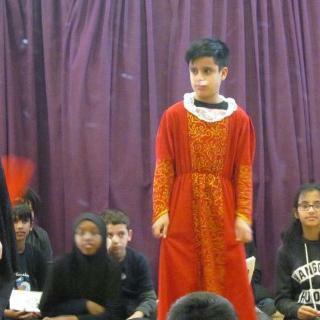 Year 6 had a chance to perform a wonderful play known as Romeo and Juliet. We were accompanied by a man who represented SPLATS (Paul). Paul is part of a theatre company where they come into schools and teach the pupils a variety of different plays. We were split into 4 groups, each practicing a different scene. We wore black and were given props to disguise ourselves as the character we had chosen. Throughout the day, we practiced our lines and perfected our acting skills. We then performed to Year 4, Year 5 and some of our parents.